While you may catch your little princess wobbling in your shoes or even Junior “shaving” with his father, the truth is, parents don’t want their kids to become little clones of themselves. 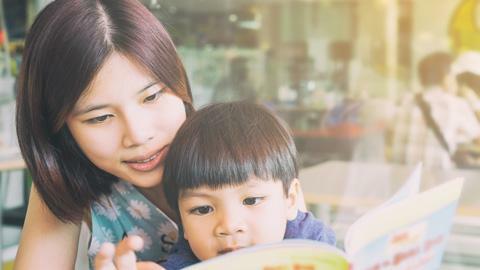 Kids tend to copy what their parents do; that includes those moments when you fall into a pit of self-criticism, as explained by Kaydee Dela Buena of The Asian Parent Philippines. Research shows that if your friend is happy, that brightness will infect you; if she’s sad, that gloominess will transfer as well. So if a parent is exhausted or frustrated, that emotional state could transfer to kids. 2. Start building your child’s social skills. Baer and Gillett also learned that it’s never too early to teach your child some social skills. Citing a 20-year study, they saw that socially competent kindergartners (cooperative, helpful, independent, etc. ), were far more likely to earn a college degree and have a full-time job by age 25. 3. Develop your relationship with your child early. As discovered by Baer and Gillett, a 2014 study showed that kids whose needs were cared for and felt secure in their first 3 years of life actually did well in their academics and relationships—all the way to their 30s. When you have big expectations for your child, she actually more likely to achieve them, according to educator Dr. John Mark Frolland. “This is not because expectations alone are sufficient for success; but because when people expect to do well, they are usually motivated to work hard to reach the expectations,” he said. So moms, don’t underestimate your role in your child’s success. As these experts pointed out, what you say and do can go a long way in her development. Baer, D. and Gilett, R. “Science Says Parents of Successful Kids Have These 9 Things in Common.” MSN. 29 July 2015. Web. 31 Jan. 2016. Dela Buena, K. “5 ways you’re unknowingly damaging your child’s self-esteem.” The Asian Parent (Philippines). n.d. Web. 01 Feb. 2016. Froiland, J. M. “Parental Expectations, Strong Hope and Successful Children.” Linked In. 21 April 2014. Web. 31 Jan. 2016.